Lately we've been getting many people asking questions regarding FFTPatcher, which is great - but many of them are related in one way or another, and trying to use the Search Function to try and find answers can be difficult at times because of how word-specific it can be and how large the forum is overall. In light of this, please post all questions related to FFTPatcher errors here (This includes ENTD setup, Ability Setup, Job Setup, etc.) and we'll answer your question as soon as we can. This will help people have a nice "hub" to look to when using FFTPatcher as well. 1. It must be directly related to a basic function of FFTPatcher. 2. Please, please, please post a screenshot(s) of the current setup of your Job, Ability, ENTD, or whatever is giving you trouble. It is very hard to troubleshoot FFTPatcher without seeing exactly what you currently have set up because some of the oddest mistakes can result in errors. Many are fairly easy to fix, but this will save us the inevitable step where you ask a question and we ask you to post a screenshot before being able to help you anyway. Other than that, fire away. 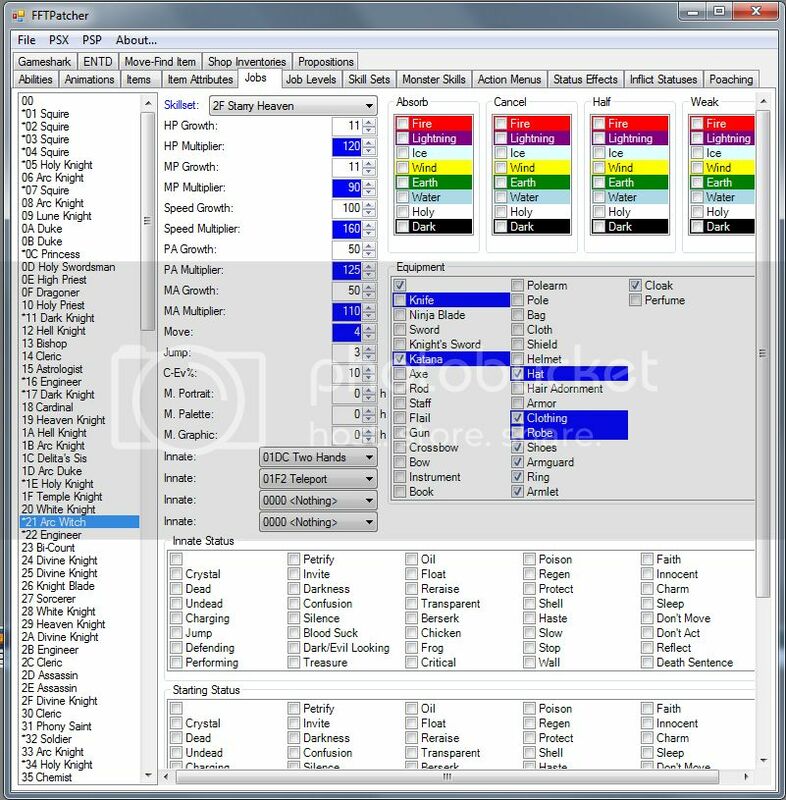 Hello, I have a FFTPatcher question. Once we have made changes inside the FFTPatcher, how do we apply those changes to the ISO and then check those changes to make sure they're working properly?? 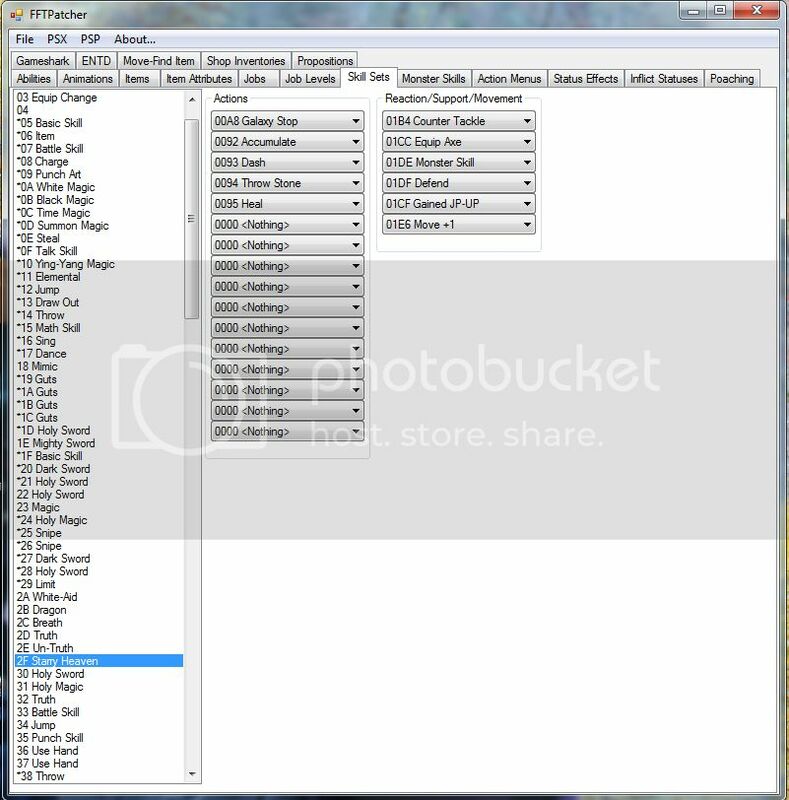 At the top of the FFTPatcher we see FILE and PSX drop down menus which have SAVE PATCH and PATCH ISO. If I save patch, it saves as a fftpatch file... do I need to convert that into a PPF file? Or how do I do that? Also is there a quicker way of checking those changes? Thanks in advance! Every word man speaks is a plagiarism. .... Ok so I figured out my above question partially, but do you know of a way to quickly jump from the FFTPatcher to the game in order to test certain battles?? For example, after making a change in the ENTD tab of the FFTPatcher, can we jump right into that specific battle to experiment our tweaks? Thanks! Hello. I am new to the forums, though I've been using them for a little while now, having been able to answer my own questions by searching. Yet, this problem either has not been experienced by others or, as you said in your OP, is specific enough that it's hard to find via a search. I'm working on my own hack with very different classes and have linked the abilities and skill sets so that everything works in-game, except each character randomly has access to abilities which they have not learned in the formation screen. For example, as you can see in the screenshot that I attached, I am not changing the basic class much, other than adding Cure and Fire. In the formation screen, Squire X will not have learned, say, Accumulate, and yet will be able to access and use it in battle. This happens for all characters and all classes. So, as new jobs open up, they learn the cheapest ability, then in battle they can sometimes have 6-7 abilities which are unlearned (and stay unlearned in the formation screed), yet they can use. Is this something that anyone has run across before? And thanks for any replies! Also, as kind of a p.s., I finally figured out how to change the enemy sprites via the ENTD so that the custom sprites that I am using that don't have more than one palette will still show up. Is there a more general way to do this (i.e. all enemy knights use palette 0) or do I need to go through every event and tell the problematic sprites individually to use specific palettes? I assume not, but I'm asking anyhow! player generics must have their skillset the same as the default, such as squire must be using skillset 05 or you'll encounter bugs if you dont because the game is hardcoded for them to be using those skillsets. you can change the abilities around but keep them in the job default skillset. What about the Generic Skillset Fix ASM? I dont know, but there is little reason to change from the generic job defaults anyways. I cant think of a reason. Hm, this helps. I initially used these blank slots, as this was my first attempt at any of this, and I wanted to keep the vanilla jobs in tact in case I really screwed things up job-wise, but had other edits that I wanted to keep. I'll see what using the default slots does to fix the problem and let you know. Thanks...! Great, that seems to have worked! I'll let you know if things get buggy again. Thanks, everyone. 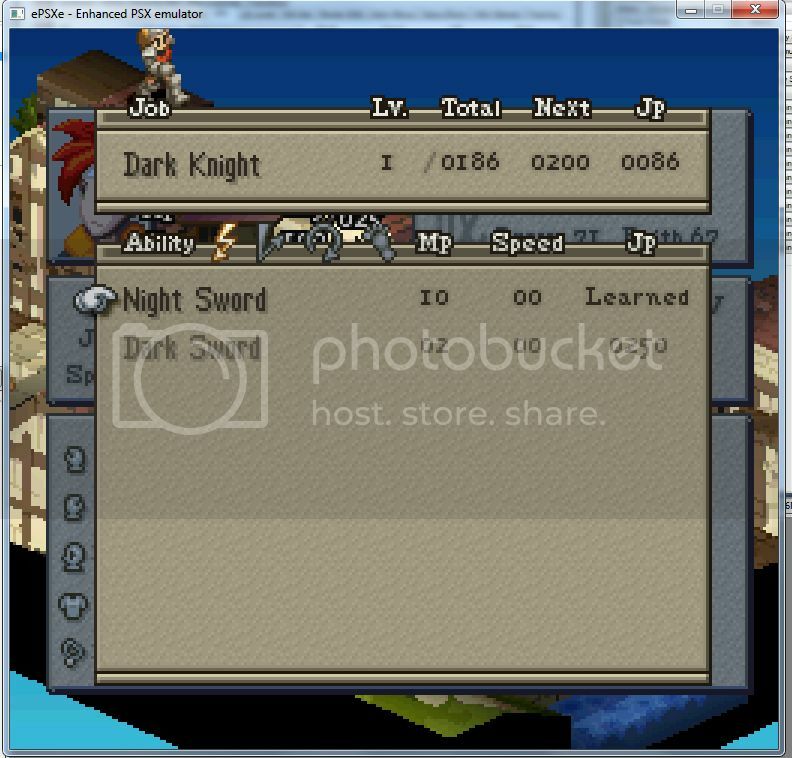 1) If I want to create a new base Job (I think that's the right terminology - like Holy Knight which replaces Squire), are there any slots on the Job tab of FFTPatcher which are either unused or otherwise okay to overwrite without causing problems to other npcs? And would this job's skill set be okay to replace without running into the problems I was running into in my above posts? You could merger the two rafas/gaff but you would have to go through the ENTD and change all the events to use the same sprite to prevent those errors. I think all special jobs (ones that either are not a generic job, or are not a monster) replace squire, so it shouldn't matter which you edit. For example, editing Balmafula's job for your use would be easy because she is never seen in battle, so it wouldn't change anything. Then you just give her a custom sprite and Boom! done. 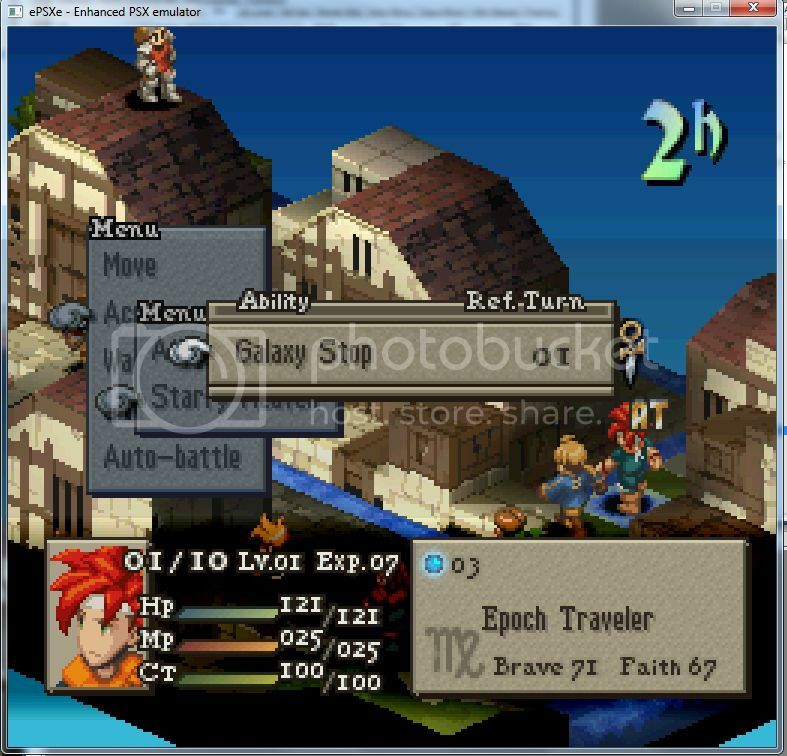 In ENTD 188, I have the Sprite Set as Gafgarian (which is replaced as Crono) and Job set to Arc Witch (per Jumza's suggestion), which I have edited to Epoch Traveler. In battle he knows an ability from my edited skill set, as he should, but if checked in the Status in battle or Abilities in Formation, the Job is listed as Dark Knight instead of Epoch Traveler and all of the Dark Knight abilities are learnable. I have successfully replaced plenty of sprites and edited most jobs thus far for my homebrew, hobby patch, but never by adding a special, new job via the ENTD. Thus, I'm a bit perplexed as to why their jobs link correctly to a point, but revert in Formation. Again, I'll post screenshots tomorrow. Maybe someone can help without them, though, in the meantime. Thanks. Here are the screenshots. Also, a couple of notes: I haven't yet added Crono's name due to my FFTactText doing this weird thing where it sometimes allows my to patch and other times it gives me an error about the OPEN.LZW unable to process; second, I haven't changed Crono's formation sprite or portrait (unit.bin / wildface.bin), as I'd like to fix the basics of the job functioning before getting to the details. ... I have no idea so Ill let someone else attempt it. The open.lzw error usually is solved by deleting all of the kanja text such as the graphic novels. Your Sprite ID and Job ID must match. If you're going to use the Enemy Gafgarion Job, you must edit the Enemy Gafgarion Job. (Any unit that has two sprites has two instances of their Job in place as well.) When you check your status screen, it is determining your base Job based on your Sprite ID. Basically, to avoid errors, should Sprite ID = Job ID at all times. Oh, okay, thanks Raven. I'll try this again and I'm sure it will work this time. That has been seriously messing with my brain. I guess I never ran across it because I've only edited generic jobs and tweeked special jobs which already existed. Ugh, so this is the kind of problem that I was hoping to avoid with my question about replacing unused jobs/sprites without causing problems. It seems there's only one Gafgarion and one Rafa in the unit.bin and wildface.bin. If I change them, I assume Gaf/Rafa will be messed up later. Actually, looking at the unit.bin in FFTEVGRP, there's not really a good unit to change b/c there are no duplicates. One will end up ruined down the road. ps. I posted this here since they're all along the same breadcrumb trail of issues started with FFTPatcher - I'd gladly re-post in another section if need be. 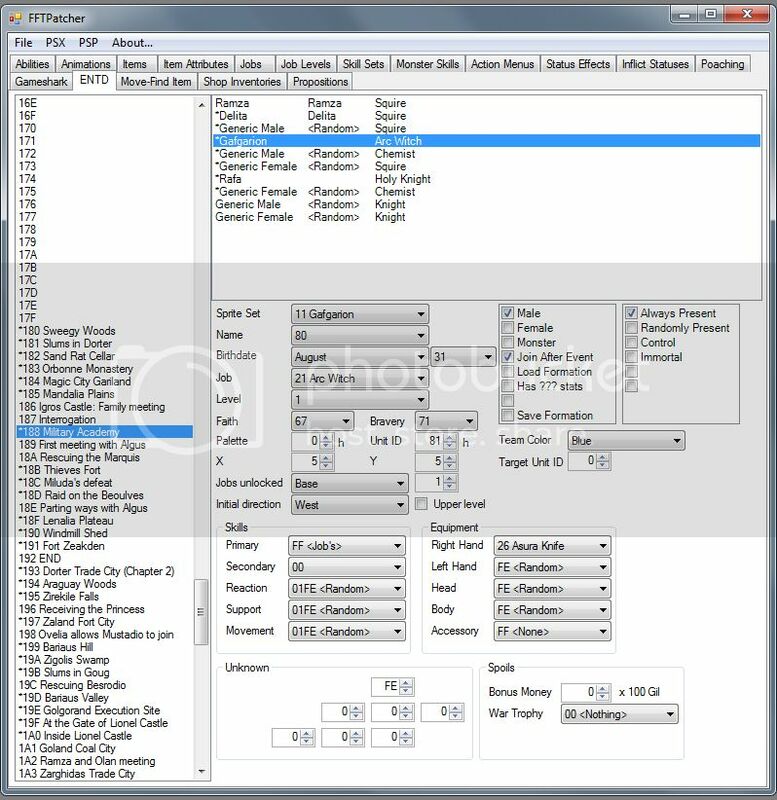 You can use UWEntries Spreadsheet Tool Glain made a long while back to change the WLDFACE/UNIT info tied to each Job, giving the unused formation data of someone like Balmafula to the Gafgarion or Rafa you're replacing. You can find it either in its own thread with a quick forum search or download my Workbooks and use the one contained there.